A UK charity appeal launched after the Asian tsunami disaster is to close at midnight after raising £300m. The Disasters Emergency Committee, an umbrella group of 12 aid agencies, said there was enough money to carry out relief and long-term rebuilding work. DEC chief executive Brendan Gormley thanked the generosity of the British public in raising the "amazing" amount. The UN believes about 250,000 people died in what it describes as "among the worst human tragedies in history". On Friday, prime minister Tony Blair said the number of Britons thought to have died had dropped from 249 to 199. The number of confirmed dead remained at 61. "The British public has created an amazing £300m fund that is making a huge difference to people from Sri Lanka to Somalia," Mr Gormley said. "Thanks to their generosity, hundreds of thousands of people who lost everything now have food, clean water and shelter. "Despite the scale and complexity of the challenge we are spending this money wisely and well, and will regularly report back on progress." The DEC has already allocated over £100m for the first phase of disaster relief. It said the rest of the appeal fund will be spent on reconstruction and re-establishing livelihoods over at least the next three years. 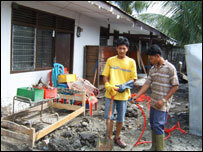 Aid agencies which made up the DEC were given cash from the umbrella group to fund their work. Among them was the British Red Cross, whose international director Matthias Schmale said: "The phenomenally generous response of the British public has been overwhelming. We would like to thank everyone who has given money to the DEC appeal. "With money from the DEC, we anticipate that we will have up to £60m to spend across the affected region to help people rebuild their shattered lives." He added: "We have sent vital relief items, including 20,500 family kits - each providing essential assistance for five family members - to Indonesia and 20,000 family kits in Sri Lanka." Mr Blair said the generosity of the British people had been "remarkable" and the money raised would "do an awful lot of good" in rebuilding areas affected by the disaster. 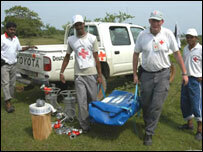 And Oxfam International hailed one of the most successful responses to an emergency in recent times. The charity's International Director Jasmine Whitbread said: "The massive public response and money from donor governments shows what can happen when a crisis is quickly and properly funded."